Common Heating Myths Uncovered | Carroll Plumbing & Heating Inc. Heating and cooling systems are inefficient enough without regular maintenance and tune-ups. What if we said you could be unknowingly contributing the poor performance of your HVAC system? Beyond scheduling routine maintenance and doing your part by changing air filters, the very things you think are helping improve comfort and efficiency in your home could actually be having the opposite effect—and all while increasing your energy bills. Some homeowners believe that lowering the thermostat and depending on alternative heat sources will save money. Although fireplaces and space heaters do a great job of keeping high-use rooms warm and cozy, they certainly aren’t the most efficient (or safe) options. Space heaters quickly add onto your average energy bill, especially if you run them constantly. Fireplaces, on the other hand, are a suitable alternative, but when running in conjunction with your heating system you could be losing heat. Fireplaces have the tendency to release heated air right out through the chimney. To avoid heat loss, don’t run the heat and fireplace simultaneously. Contrary to homeowner belief, turning up the thermostat even just 5 degrees on very cold days won’t get you to an optimal temperature faster than being patient. This is a misconception many believe because it’s assumed the thermostat holds the power when it comes to heating and cooling. However, the primary, and only, role of the thermostat is to power the system on and off when optimal temperature is reached. The only thing that happens when you bump up the thermostat is your system is encouraged to run longer and expend more energy. Instead, adjust the temperature throughout the day based on occupancy and behaviors. The DOE estimates that you can save about 10% per year on energy costs by turning back the temperature 7-10° from your normal setting for 8 hours a day—which is a great reason to use your unit’s programmable features. Myth #3 Programmable thermostats—set it and forget it? As popular as home automation is, it’s natural to assume that the right technology allows you to sit back and not do a thing. With some gadgets and devices this is true, but with programmable thermostats, it’s not always the case. Just because your thermostat is programmable or wireless, and intelligent enough to learn your preferences, doesn’t mean it will do all the work for you. It takes a great deal of fine tuning to set the right schedules for optimal comfort and system efficiency. Investing in a great thermostat can impact energy bills, but not until you invest the time in learning the technology and programming it to work for you, not against you. You can always blame old, inefficient, drafty windows for air loss during both heating or cooling season. But, don’t go budgeting for replacement windows just yet. Sure, brand new professionally installed windows are wonderful, but it’s a huge investment and may take time for the investment to be offset by energy savings, so it’s not an instant fix. According to the Energy Star program, replacement windows can save anywhere between $126-$465 per year. In the meantime, you may be better off testing various weather-stripping and draft-free solutions to seal cracks that allow air leaks. Another affordable option? Consider a home energy audit to locate the source of inefficiencies in your home and HVAC system. Letting those ceiling fans collect dust in their off-season? Think twice. Ceiling fans aren’t just for summer time. When it’s sweltering out, they make you feel more comfortable by circulating cool air and pushing it downwards, but they also operate in reverse. That little switch is there for this very reason. For cooling, you want fans to rotate counterclockwise. However, in the fall and winter, flip your ceiling fan switches into clockwise position. This rotation prevents heat buildup at the top of the room by pushing warm air downwards and distributing evenly throughout the occupied space. 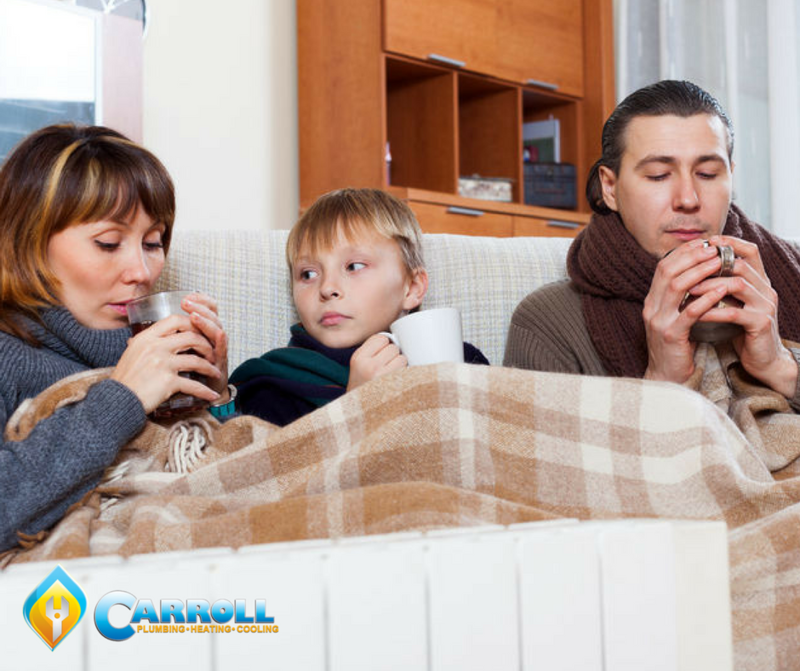 At Carroll Plumbing & Heating Inc., we understand how important it is for you to save money on heating and cooling costs. That’s why we offer a variety of HVAC services, including preventative maintenance and seasonal tune-ups to ensure your system is prepared for the season ahead. Our knowledgeable, experienced technicians can answer any questions regarding best practices for using your heating and cooling systems in your day-to-day. We’re happy to be a valuable resource when it comes to assistance with programmable thermostats, new equipment installations, troubleshooting and anything pertaining to your plumbing system. For your residential plumbing and heating needs, contact Carroll Plumbing & Heating Inc. today!